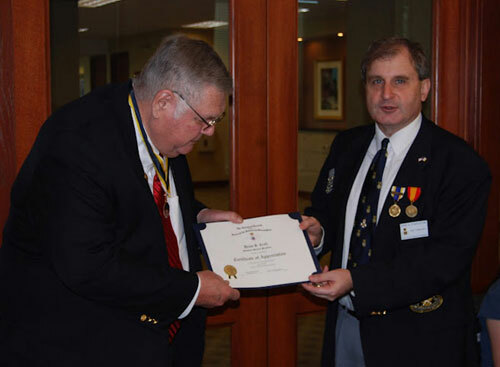 The Harry S. Truman Chapter was privileged to have MOSSAR State President Denis Craft conduct the 2012 HST Chapter Officer Installation at the January 14, 2012 meeting. The Harry S. Truman Chapter Color Guard is shown here during the installation. President Dirk Stapleton presented MOSSAR State President Denis Craft, who was also our guest speaker at the January 14, 2012 meeting, with a Certificate of Appreciation and a HST Chapter Challenge Coin. President Craft spoke on activities at NSSAR and MOSSAR. He stated that the Harry S. Truman Chapter was a great chapter, and to continue the good work in providing service to MOSSAR and our local community. MOSSAR State President Craft stated that we should continue to encourage youth to compete in the Eagle Scout Scholarship, Knight Essay, and Rumbaugh Oration competitions. He suggested that new members need jobs to keep their interest. Left Photo (L - R): President Denis Craft, MOSSAR State President; Major General Robert L. Grover, MOSSAR Color Guard Commander; Dirk A. Stapleton, HST Chapter President; Donald Lewis, Jr., HST Chapter Vice-President; David McCann, HST Chapter Registrar-Genealogist; Romie Carr, HST Chapter Chaplain; Paul Toms, HST Chapter Sergeant-at-Arms; and Brian Smarker; HST Chapter Historian. Compatriots not shown are Courtney Sloan, HST Chapter Treasurer; George DeLapp, HST Chapter Chancellor; and William Hartman, HST Chapter Honorary Vice-President. Right Photo (L - R): President Denis Craft, MOSSAR State President; and Dirk A. Stapleton, HST Chapter President.